I’d been expecting a quiet January but suddenly it became a very exciting few weeks. If cooking for artists at my local recording studio (and getting a sneak preview of their new albums) wasn’t exciting enough, I then found myself preparing to speak at my first ever TEDx event. When I first announced at home that I’d been asked to speak at a TED event my teen was very impressed; “You’ve been invited to do a TED talk?…whoa, you need to be amazing, awesome and funny…. and entertaining and inspiring” she said incredulously as if there was no possible way on earth I could do that. No pressure then. To be honest when asked I had little idea what a TED event was. I’m very used to speaking at schools and colleges in my role as a Dynamo Role Model but this I discovered was something very different. Slightly daunted I dutifully went off to do a bit of research to find out what it was all about. For all of you as unfamiliar with TED conferences as I was, they are in short ‘Ideas Gatherings’…which bring together a group of (hopefully) inspiring people to share stories, visions, ideas and plans. TED stands for Technology, Entertainment and Design. The idea to bring together people from these three arenas took shape in the US, but since its start in 1984 the scope of TED has grown considerably. They hold two annual conferences in the US and a TED Global event in Edinburgh. In addition local independently run TEDx events are held. All of the talks and videos are then uploaded to their website for a wider group of people to get access to and so they are consequently often used for training. 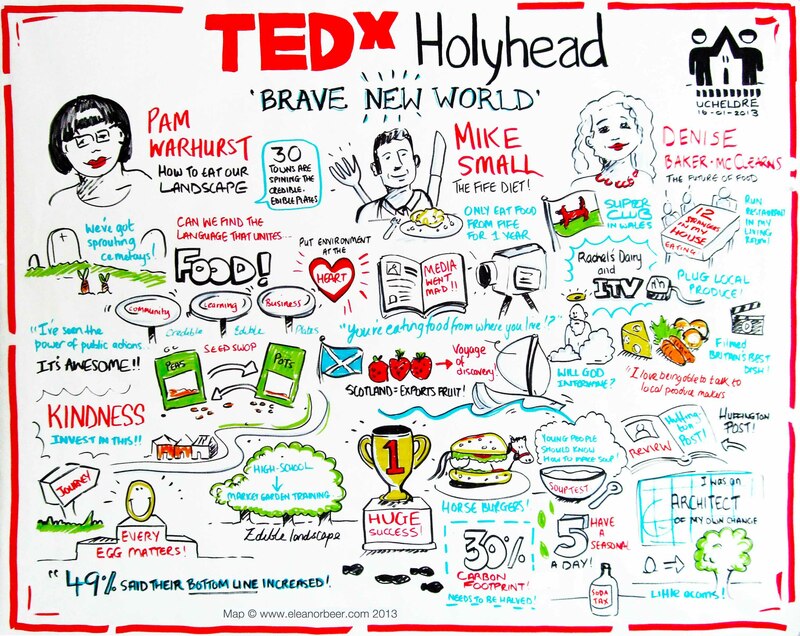 The TEDx Holyhead event was put together by a team of local ‘thinkers’ from a range of disciplines, with talks based loosely around a central theme ‘Brave New World’. 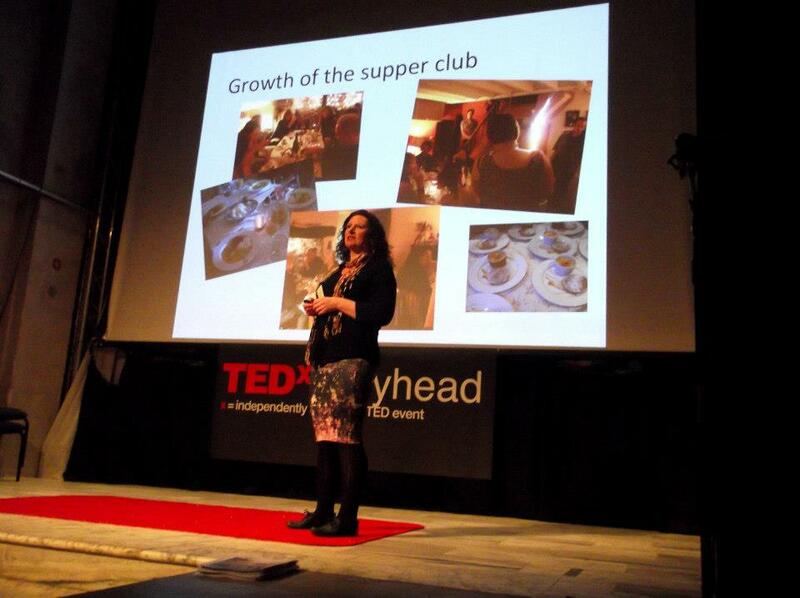 They asked me to talk about my path from redundancy and despair at being unable to find a job to becoming a supper club host, freelance food writer, blogger, chef and general promoter of local producers and Welsh/British produce. They wanted me to describe how I created my ‘Brave New World’ through entrepreneurship and sheer desperation to earn a living! This said it was not an easy job to describe that journey in 10 minutes!! I was a nervous wreck before the talk and even though I prepared cue cards and a plan I ended up throwing them to the side and just went for it! I’m dreading watching the video as I cannot remember a single word of what I said, but I was only a minute over so I did pretty well! If you get the chance I would highly recommend attending one. Just as a networking event it proved really useful and I gained so much from meeting like-minded people. I hope it becomes a regular fixture in the calendar of the hosts, the Ucheldre Centre in Holyhead. If you can’t make it to one then check out the website both of the Holyhead event (where you can laugh at my video!) and the central TED site where a variety of talks and events can be viewed. Then after that? Who knows, you might even be inspired to set up your own TEDx event!